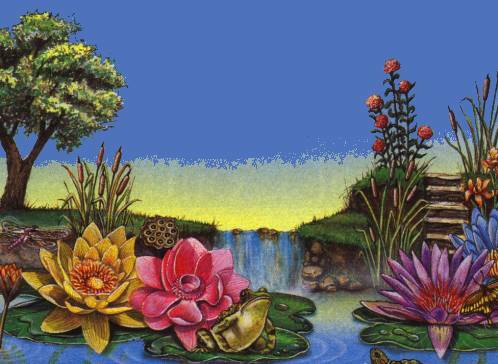 Adding plants to your pond will bestow many benefits. Their beauty is, of course, obvious. However, plants also help to impede the growth of algae by using nutrients (which would otherwise feed algae) and providing shade (which deprives algae of sunlight). Where plants thrive, algae suffers. Plants also provide hiding places for fish, which reduces stress and illness. Plants also produce oxygen through photosynthesis. Pond plants are divided into several groups. Floating plants are divided into two groups depending on the location of their roots. Those that grow with their roots in the soil and their leaves on the surface include lilies, parrot feather, lotus, etc. "Hardy" lilies or other water plants are essentially perennial. They usually survive the winter outdoors and come back year after year. Tropicals, on the other hand, should be brought inside during the winter months or purchased each spring when you re-start your pond. Potted water lilies should be kept in pots with mesh baskets, which allow roots to spread, and allow plants to develop specialized fine feeder roots that grow through the holes and extract nutrients from the pond. They also allow numerous pots to root together, forming a large mass that is harder for wind or animals to knock over. Plant them at a depth between 18 and 30 inches under water, although they should be started much shallower (6"-12") in the spring to be exposed to more sunlight. A second type of floating plant grows with the entire plant at the water's surface with roots dangling in the water. Water hyacinths (which are illegal in Texas and some other locations), clover, water lettuce, and azolla are examples of this group. Submerged aquatic plants grow entirely beneath the surface of the water and are rarely seen. Although called oxygenating plants, they only produce oxygen in the sunlight. They actually consume oxygen at night. Submerged plants are very efficient at utilizing nutrients, which would otherwise promote algae blooms. Their presence improves water quality, provides an area for fish to spawn and serves as a shelter for small fish. Examples of submerged plants include elodea, anacharis and hornwort. Marginals are plants that grow on the edge, or margin, of a pond, (sometimes called bog plants) usually requiring 1-6 inches of water above their crown. Roots can be wet, but stems and leaves can be above the water's surface. The top of the pot should be between 2 and 6 inches under water unless they are of the taller varieties such as Cattails and Papyrus which can be as deep as 12" after they are well grown. "Hardy" marginals would include Acoris, Aquatic Mint, Arum,Arrowhead, Bog Bean, Cattails, Clover, Golden Club, Houttonia, Iris, Lizard's Tail, Plantain, and most Rush. Tropicals would include Blue Bells, Bog Lily, Cannas, Papyrus Sagittaria, Spider Lily, Taros, Thalia, Umbrella Palm, Water Hibiscus, and Zephyr Lily. In a water garden, it is often advisable to place your plants in pots. This enables you to change planting heights, reposition, prune and separate when necessary and allows for easy removal for winter storage and pond maintenance. It is also a good idea to protect pots and roots with wire cages if your pond contains plant-eating or plant-rooting fish such as Koi. Rapidly growing plants in the summer months require more fertilizer than slower growing plants in cooler seasons. If fertilizer tablets are used, they should be applied directly to the roots of such plants, beneath a heavy layer of mud, to prevent the entry of the undesirable fertilizers into the water itself. Never add products containing phosphates and nitrates directly to the water, as this would certainly encourage green algae growth! Another misunderstood part of your pond ecosystem. Many people shy away from rocks and gravel on the bottom of their pond for fear of a maintenance problem. The visual appeal of your pond is greatly enhanced by a more natural-looking bottom. Aditionally, gravel and rocks add more biological filtering activity because the beneficial bacteria that devour the excess water nutrients cling to and reproduce on them. They also provide more shade to help protect your pond liner from UV light degredation. For information about winterizing your hardy plants, see our tips on Winterizing Your Pond.